One of my clients, Janis, who has been receiving massage for the last few years, developed trigger finger. She has never been addressed via massage for this problem. The "trigger finger" diagnosis arose 6 months ago after Janis woke up one night with excruciating pain in her middle finger. This event was not preceded with any change in daily activities, work environment (new chair, table, etc), or change in sleep conditions. When she woke up that day, she was unable to extend her hand open, the middle finger staying closed and becoming very painful upon movement. She saw a doctor who immediately gave her an X-Ray (Trying to acquire this image), and diagnosed her with trigger finger and tendinitis in the hand. 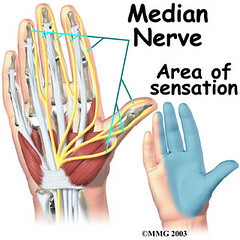 The pain came most frequently on the palmar side of her hand, between the Medial Interphalangeal [MIP] or Palmar Digital joint and the Proximal Interphalangeal Joint [PIP]. Janis reported the pain inside the joint capsule of the hand itself. "It feels very deep as though its inside the joint." Tendinitis (informally also tendonitis), meaning inflammation of a tendon (the suffix -itis denotes diseases characterized by inflammation), is a type of tendinopathy often confused with the more common tendinosis, which has similar symptoms but requires different treatment. The term tendinitis should be reserved for tendon injuries that involve larger-scale acute injuries accompanied by inflammation. non.The label of trigger finger is used because when the finger unlocks, it pops back suddenly, as if releasing a trigger on a gun. Focusing on the anterior compartment for the deep work, I started with warming the shoulder, and side muscles. Doing some myofascial (connective tissue) stretching, I warmed up the entire affected side quickly. Moving in with some traditional stretches, I had Janis resist some portion of the stretch, and then relax so that I could further extend her muscles and give them some better pliability for when the deep work started. Moving anterior, we did some more stretching and general warming. Starting with the front upper arm, I stripped all the musculature trying to work superficial to deep, exploring any adhesion or tension spots; Moving next to the area typically affected by median entrapment, the anterior compartment, I found the bulk of the trauma to be here, more specifically, in the Pronator Teres muscle (Illustrated to the right). I attempted to do deep warming and stripping on this muscle and area, but the tension was too great! As I worked, Janis reported sensations of electric tingles moving instantaneously to the affected area. With the remaining time (15m) I focused on the pronator, working each side of the muscle head, and working towards the muscle belly. With a large amount of resistance, the muscle slowly gave way slightly. I tried some alternate routes of muscle manipulation, and finished up with some cool down and energy work. Doing some push pull with the stuck energy (energy modality) during the work, and finishing up with some Reiki, the tissue remained somewhat stuck. Janis said her hand felt better, but I asked her to refrain from judging any progress for a day or two, then let me know what changes she feels. I am fairly certain that with some constant attention to rehabilitation, and altering personal patterns that caused this in the first place, Janis can avoid surgery altogether.